Dinner with a Vet Student is scheduled for February 23, 2019! The event will be from 6:00PM - 9:00PM in Multipurpose Teaching 2110. You can access a map here. ​This details where the Multipurpose Teaching Building is. This event is open to non-members as well! Tickets are $10.00, dinner will be included. If you would like to purchase a ticket, venmo our Treasurer Aidan (@Aidan-Romo). 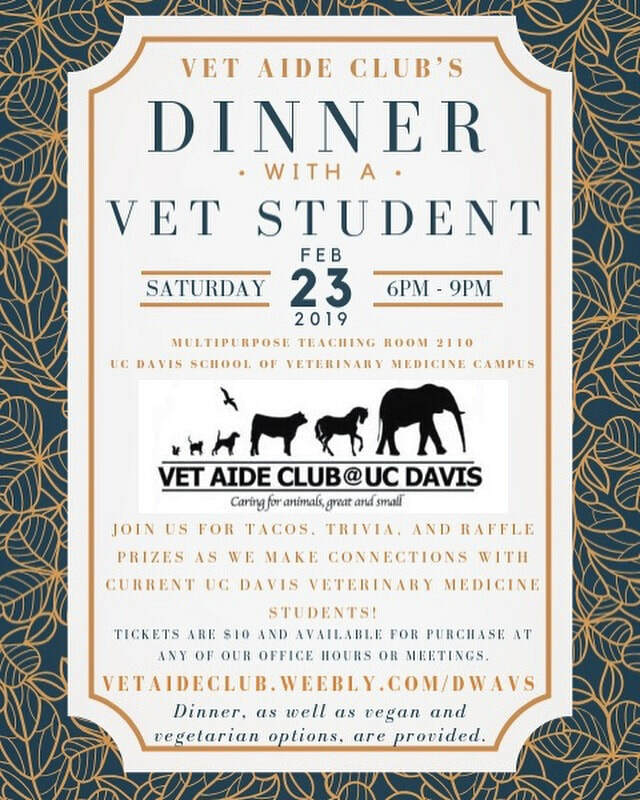 ﻿﻿Every year we hold our “Dinner with a Vet Student” event where we have veterinary students from the UC Davis Veterinary Medical Teaching Hospital come together to meet with the Vet Aide Club to discuss preparing for veterinary school, what veterinary school is like, and how to succeed in getting to veterinary school. Join in for an evening of DELICIOUS food, Q&A's, AWESOME prizes, and some real fun with the Vet Aide Club. 2019 Dinner with a Vet Student Tickets are sold at Office Hours or Meetings! Come with cash or a check and we can register you for the event! If you are unable to come to these times, venmo @Aidan-Romo!